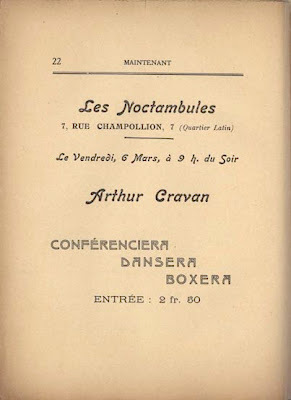 Bookride: Arthur Cravan. Maintenant 1912 - 1915. Maintenant goes for much more than that. A complete set sold at auction in Paris for about $50,000 about ten years ago, it would probably by $60K or $70K now. 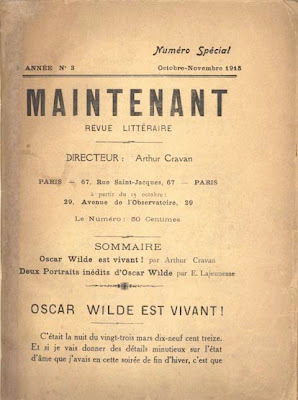 Maintenant puis, Maintenant puis, Maintenant puis - an issue sold on Ebay early 08 for 9.50 Euros. Also, some years ago a young spanish director made a fascinating documentary called Cravan vs. Cravan. Sims have a fantastic set at £35K they would probably take $40,000 for. It's gone up and gone down-- wish I could find a set for $10000. My price now looks a tad cautious!